I immediately asked her where she got the contact paper that she used. I had searched multiple times in the past and hadn't found anything I loved. She told me it was from the Macbeth Collection on Amazon (current promotion is buy 4 for the price of 3!). I had actually looked at the Macbeth Collection website but for some reason there is a bigger selection of their liners on Amazon. I ended up buying four different patterns. 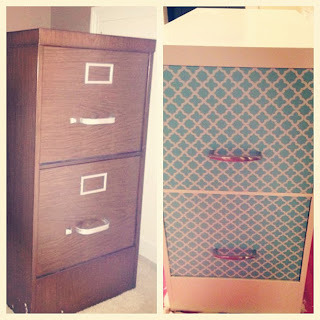 I used the exact same pattern Brittany used-I just love it!. I also got the same pattern in pink but I thought the blue looked great with white. I think I may be craft challenged because this was REALLY hard for me. Removing the handles took forever! The finished product has a few bubbles and a scratch in the contact paper. It's definitely not perfect. 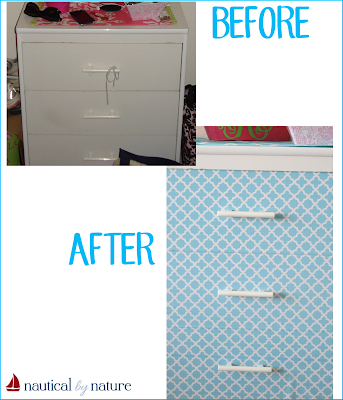 I think part of that is because this was some cheapo dresser that had lots of bumps, tape, glue, etc on it. BUT I am also not a perfectionist and I basically gave up and just went with it. I did try to measure at least! I decided to do the shelves on the bookcase in my bedroom too. I will post those photos when I am finished moving things around. Have you ever used contact paper to give something a little makeover? 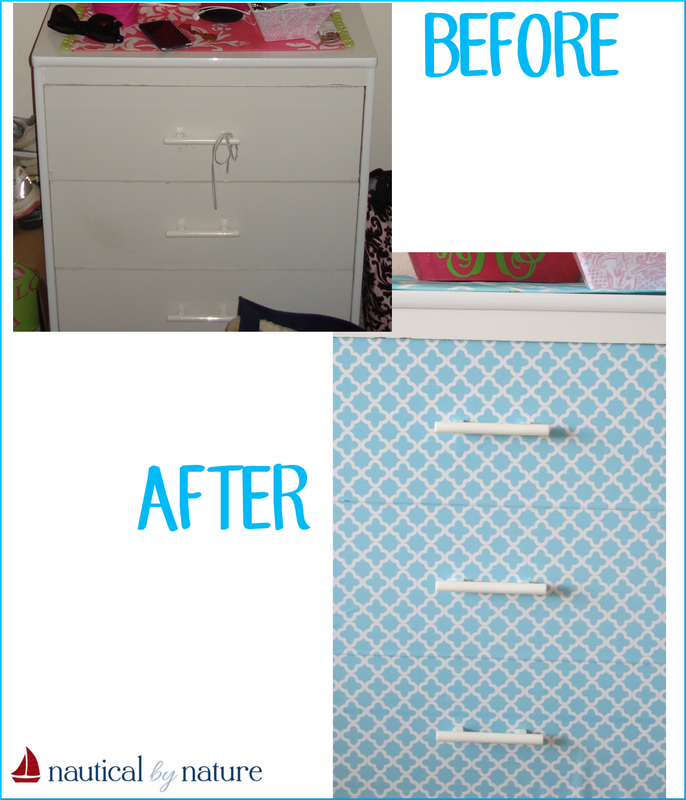 Such a cute and easy way to spruce up old furniture! This is such a great idea and it looks so good! I never would have thought of doing something like this! I have never done this before, nor seen it, but I love the impact it has on the piece. It looks so much better! I like the empty space at the bottom to balance out the colors, for sure. Definitely like it with the white. I think the border is a good idea. I am sticking with the white border. It looks better like that in person I think!